"You don't want to make things harder on yourself than they already are," said the kind and well-meaning hospice chaplain. We were in my living room at our first -- and, I should say, last -- meeting. My terminally ill husband was in the other room, probably with one of the many friends who came to keep him company and give me a break from round-the-clock caregiving. I had mentioned to the chaplain my intention to speak at my husband's funeral. We didn't know when it would be, but he had been diagnosed with a 13-month-average-lifespan brain cancer 6 or 7 months earlier, and had recently become a hospice patient. I had been kicking around what I wanted to say at his funeral for a while at that point – primarily when I went walking. in college I used to compose papers in my head while walking from the US capitol to the lincoln memorial (and back). I could never have imagined that 20+ years later I’d fall back on that method — walking — to compose remarks for my 44-year-old husband’s funeral. I should say, as an aside, that walking tends to be when I do my clearest thinking. 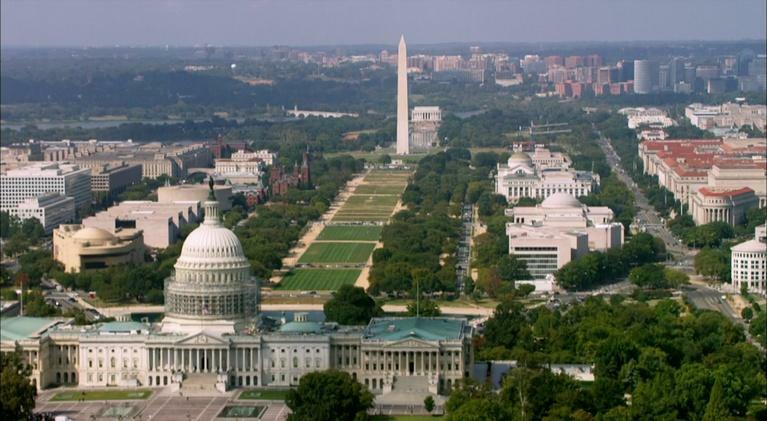 It's when I wrote my best papers in college -- I'd head out on a couple-hour walk from the Capitol to the Lincoln Memorial and back, and by the time I returned, I had composed a 5 or 10 page paper in my head. I just had to sit down and type it out. So, I had been walking around the neighborhood composing funeral remarks in my head. That doesn’t sound weird to me these days, as I type it now … but I’m sure back when I was composing college papers on walks, I would never have imagined that someday I’d be taking that same approach when preparing to eulogize my 44-year-old husband. But, he didn’t know me. He didn’t know that I’d been blogging on Caringbridge since the beginning of my husband’s illness, sharing our journey with family and friends near and far. That 78 posts and 29,000 site visits later, I needed to speak to the people who’d been supporting us for so long. I needed to reflect on my husband’s life, and I needed to thank our community for their role in the hardest time of our family’s life. And so, I thanked the chaplain for visiting, and we wound up the conversation. I was pretty sure I was going to ignore his advice, but a little part of me did keep wondering what this expert knew that I didn’t. I’m proud to report that I did make remarks at my husband’s funeral. Parts of it I had been carrying around in my head for months, turning over ideas and refining wording at every chance I got. Parts of it came together in the final days before the funeral. All of it I was satisfied with; even as I re-read it now, 3 years later, I wouldn’t change a word. Mostly, I am satisfied that I trusted myself on this one, and didn’t let the hospice chaplain talk me out of what I knew to be the right decision for me. It seems like a simple question. Uttered, often, without thought. A greeting, almost. And then everyone goes about their day. Except, when your 44-year-old husband has brain cancer, it’s not such a simple question. The question might come at school pickup. It might come by text; it might come from a neighbor or friend stopping by with dinner; it might come on the sidelines of the soccer field. Getting this question – always from someone sincere and well-meaning, I should say – would cause fits of uncertainty in me. Who is asking? Do they really want to know, or are they just being polite? How much do they already know? If I were to even begin to answer, how much context do I need to give? Are they interested in summary-level status, or the details of the latest medical news? Am I even interested in telling this person how I really and truly am? More often than not, all these thoughts would swirl in my head for a fraction of a second, I’d sigh and give up, and out of my mouth would come: “fine.” Which was neither helpful nor accurate, but it was all I could muster. And I’d miss a chance to connect with someone who really did care, and really did want to help. Sheryl Sandberg, in her book Option B, talks about learning after losing her husband that “how are you today?” is a much more manageable question. I agree, and I try to stick with this when speaking with someone I that know is going through a rough situation. Generally speaking, I’ve been trying, since my experience with my husband’s terminal illness, not to default to “how are you” as a greeting. “Good to see you,” “what’s happening?” or “what’s new?” are all great options. I don’t always remember, but I always hope to. And, I am happy to report that, if you run into me today and ask “how are you,” I will answer “fine.” Maybe even “good” or “great,” depending on the day. No existential tail-spinning required. 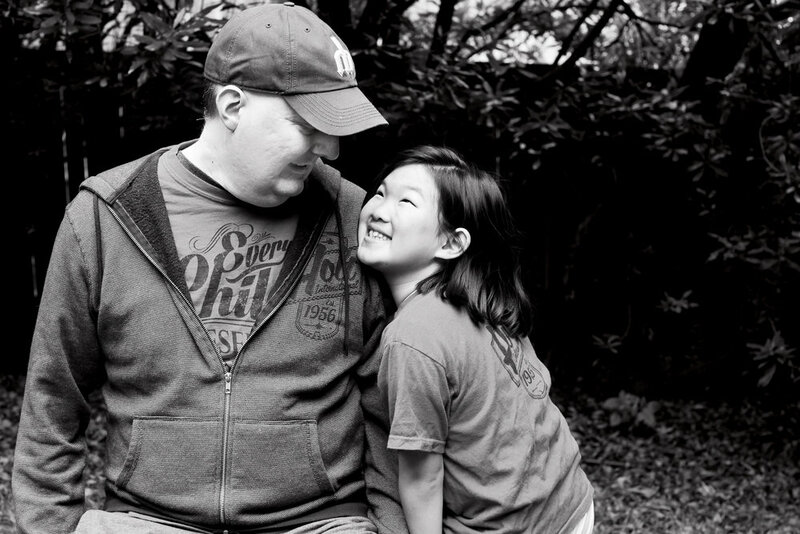 Megan (then age 8) and her dad shortly before he went on hospice (September 2015). Photo courtesy Rebecca Ort photography. We weren’t talking about cancer. Or careers. We were talking about snack and homework. 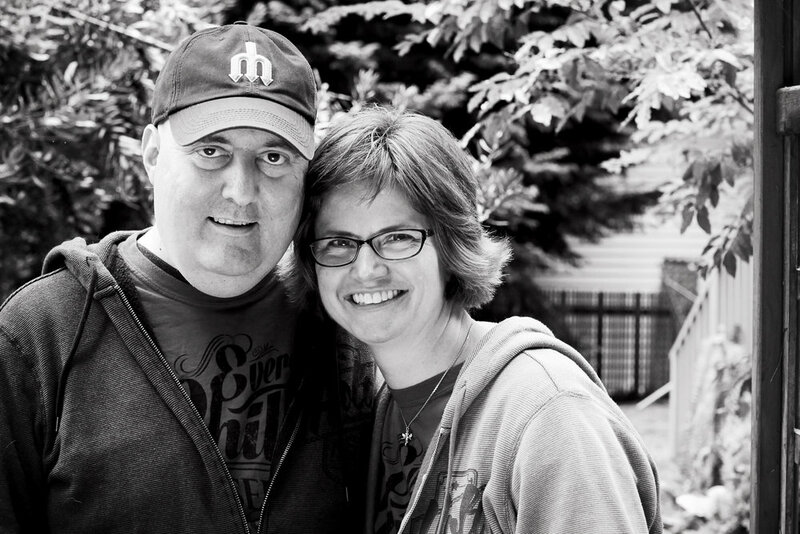 Just ten months earlier her dad — my husband — had died of brain cancer. It was glioblastoma, the same type that Teddy Kennedy, Beau Biden, and more recently John McCain, had died of. Megan had been struggling with our loss. In her seemingly offhand comment, we found a way to help her turn her grief into action. Dr. Charles Cobbs, of the Ben and Catherine Ivy Center for Advanced Brain Tumor Treatment in Seattle, was my late husband’s doctor. He is leading exciting and critical research into some viral causes of glioblastoma. Megan had been wanting to have a table at her school’s upcoming St. Nick fair, but didn’t have any ideas of what to sell. “Maybe I could make Christmas cards and sell them, and give the money to Dr. Cobbs,” she said. She ran off to her room and got to work. An hour later, she was back with a half-dozen designs — and looking to me to figure out how to get them printed, packaged, and ready to sell. We were able to donate $500 from that initial effort, and Megan’s Cards for Cancer was born. We decided to put up a little web site and have her make some note cards and thank you cards so we didn’t have to wait a whole year to do it again. Working with my daughter, now 12, on Megan’s Cards came at a great time for me, too. It was a time when I was also struggling. My head was all over the place, and I was having difficulty focusing. Sitting down and saying to myself, “I need to figure out how to build a web site, because this project is helping Megan with her grief,” was surprisingly useful to me. It forced me to focus. I was turning my grief into action. And it was helping both of us. Just last week we crossed the three-year mark since losing my husband, Dennis. Three years he’s been gone; three years I’ve been trying to pick up the pieces; two years we’ve been raising money through Megan’s Cards. And, to date, we’ve been able to donate over $5,000 to brain cancer research. My goal is to get to $44,000, in honor of his 44 years. As Megan said when she was ten, “I want to give money for research because I don’t want any other families to go through all of the sad times like my family did.” I’m so proud of her and how’s she’s turning her grief into action. Last September, I hosted a Biden Cancer Community Summit for cancer widows and their families to turn their grief into action, too. Over 50 key players made commitments to the Biden Cancer Initiative to take action that would help advance cancer research, patient care, and more. One of these commitments — Take Action Against Cancer — grew directly from my experience turning grief into action in my family. If your family has been widowed by cancer, you can join us for the first-ever Take Action Against Cancer Day of Service and turn your grief into action, too. It’s happening the weekend before February 4, which is World Cancer Day. It’s a way to give back while having fun with your friends and family. Or, if you want quick-and-easy, there are a couple of online options, too. My family has certainly found this to be true. We hope yours will, too.